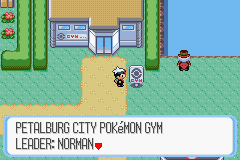 Petalburg City, unlike the previous city, has a gym. You won't be able to battle here, though, since this is supposed to be the fifth gym, and you need to visit the first four gyms to get the first four badges before coming here. After you heal your Pokemon and go to the Mart, you'll want to go on to the next city. But you can't, because a guy stops you from going on to Route 104. Because of this, you'll have to go into the gym, and talk to the gym leader. He's also your father. A person called Wally comes in, and tells your dad he wants to catch a Pokemon. Your dad gives him a Zigzagoon and a PokeBall, and tells you to make sure that he catches a Pokemon. Now just sit back and enjoy the catching. He'll take you back to the gym, and you have to talk to the gym leader again. After that, leave the gym. Done with that? Go west to the next route. In Emerald, before you can leave, a mysterious guy walks up to you and tells you that he's in search for good trainers. It's time to go on, and the first place you'll be is Route 104. After battling trainers, go north and go inside the Petalburg Woods. Petalburg Woods seems dark and creepy. Search around for items, battle trainers, or even catch some Pokemon. Go north, and you'll meet up with a member of Team Magma/Team Aqua (from now on, known as Team M/A, depending on the version you have (Magma for Ruby, Aqua for Sapphire.) In Emerald, you'll be fighting a Team Aqua member. Their Pokemon are quite strong, but you'll be able to get through them. After the battle, you'll receive a Great Ball. If you want to get a hidden item, then once you enter the forest, go east, and you'll see an empty spot in the grass. Go near it, but not in it, and press "A" to obtain the Potion. Exit the forest from the south, and you'll be able to pick up a PokeBall. Finally, go back North, where you'll find another hidden item. There, you'll also find two trees. Come back here after one of your Pokemon learns the Cut HM, cut the trees, and you'll be able to see the rest of the forest. Then, get out of the forest by going north a bit more. 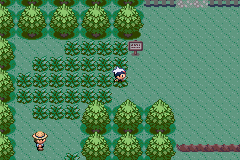 You're back on Route 104 with more trainers to fight. Talk to the first person you see, and he'll give you TM09 - Bullet Seed. You'll also see a flower shop. Go in there and talk to one of the girls. She'll give you the Wailmer Pail. After planting a Berry, water it with this to make it grow. Behind the flower house is a hidden PokeBall, Super Potion, and a visible Potion. Another item is blocked by a tree at the very east side of the route. Come back later with Cut to obtain the item. On the bridge, you'll be having your first two-on-two battle with the Twins. There's an old lady standing near the water. Talk to her, and she'll give you a Chesto Berry. Head north a little more, and go into the space between the gates and the trees. Keep on going up to pick up a X Defend. You've now arrived at Rustboro City.